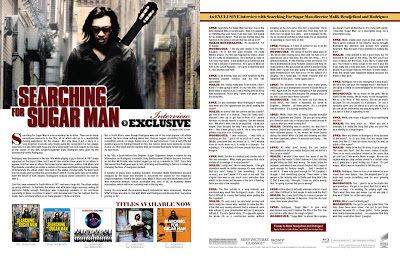 Discussions Magazine Music Blog: An EXCLUSIVE interview with SEARCHING FOR SUGAR MAN's RODRIGUEZ and director MALIK BENDJELLOUL! An EXCLUSIVE interview with SEARCHING FOR SUGAR MAN's RODRIGUEZ and director MALIK BENDJELLOUL! Searching For Sugar Man is a documentary like no other. There are so many exceptional elements to the film, all of which add up to a wonderfully moving experience for the viewer. 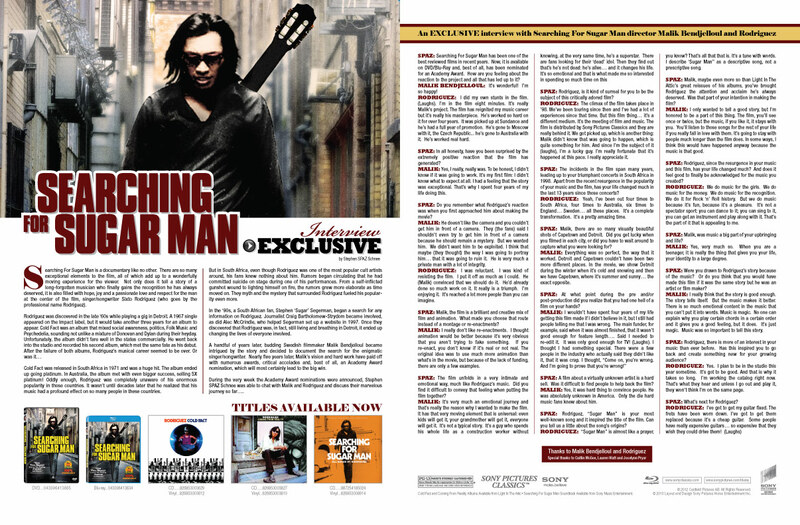 Not only does it tell a story of a long-forgotten musician who finally gains the recognition he has always deserved, it is also filled with hope, joy and a passionate love and respect for the man at the center of the film, singer/songwriter Sixto Rodriguez (who goes by the professional name Rodriguez). In the ‘90s, a South African fan, Stephen ‘Sugar’ Segerman, began a search for any information on Rodriguez. Journalist Craig Bartholomew-Strydom became involved, as did Alec McCrindle, who helped Segerman set up a website in 1997. Once they discovered that Rodriguez was, in fact, still living and breathing in Detroit, it ended up changing the lives of everyone involved. A handful of years later, budding Swedish filmmaker Malik Bendjelloul became intrigued by the story and decided to document the search for the enigmatic singer/songwriter. Nearly five years later, Malik’s vision and hard work have paid off with numerous awards, critical accolades and, best of all, an Academy Award nomination, which will most certainly lead to the big win. During the very week the Academy Award nominations were announced, Stephen SPAZ Schnee was able to chat with Malik and Rodriguez and discuss their marvelous journey so far…. SPAZ: Searching For Sugar Man has been one of the best reviewed films in recent years. Now, it is available on DVD/Blu-Ray and, best of all, has been nominated for an Academy Award. How are you feeling about the reaction to the project and all that has led up to it? MALIK BENDJELLOUL: It’s wonderful! I’m so happy! RODRIGUEZ: I did my own stunts in the film. (Laughs). I’m in the film eight minutes. It’s really Malik’s project. The film has reignited my music career but it’s really his masterpiece. He’s worked so hard on it for over four years. It was picked up at Sundance and he’s had a full year of promotion. He’s gone to Moscow with it, the Czech Republic... he’s gone to Australia with it. He’s worked real hard. SPAZ: In all honesty, have you been surprised by the extremely positive reaction that the film has generated? MALIK: Yes, I really, really was. To be honest, I didn’t know if it was going to work. It’s my first film: I didn’t know what to expect at all. I had a feeling that the story was exceptional. That’s why I spent four years of my life doing this. SPAZ: Do you remember what Rodriguez’s reaction was when you first approached him about making the movie? MALIK: He doesn’t like the camera and you couldn’t get him in front of a camera. They (the fans) said I shouldn’t even try to get him in front of a camera because he should remain a mystery. But we wanted him. We didn’t want him to be exploited. I think that maybe (they thought) the way I was going to portray him… that it was going to ruin it. He is very much a private man with a lot of integrity. RODRIGUEZ: I was reluctant. I was kind of resisting the film. I put it off as much as I could. He (Malik) convinced that we should do it. He’d already done so much work on it. It really is a triumph. I’m enjoying it. It’s reached a lot more people than you can imagine. SPAZ: Malik, the film is a brilliant and creative mix of film and animation. What made you choose that route instead of a montage or re-enactments? MALIK: I really don’t like re-enactments. I thought animation would be better because it’s very obvious that you aren’t trying to fake something. If you re-enact, you don’t know if it’s real or not real. The original idea was to use much more animation than what’s in the movie, but because of the lack of funding, there are only a few examples. SPAZ: The film unfolds in a very intimate and emotional way, much like Rodriguez’s music. Did you find it difficult to convey that feeling when putting the film together? SPAZ: Rodriguez, is it kind of surreal for you to be the subject of this critically adored film? SPAZ: The incidents in the film span many years, leading up to your triumphant concerts in South Africa in 1998. Apart from the recent resurgence in the popularity of your music and the film, has your life changed much in the last 13 years since those concerts? RODRIGUEZ: Yeah, I’ve been out four times to South Africa, four times to Australia, six times to England… Sweden… all these places. It’s a complete transformation. It’s a pretty amazing time. SPAZ: Malik, there are so many visually beautiful shots of Capetown and Detroit. Did you get lucky when you filmed in each city, or did you have to wait around to capture what you were looking for? MALIK: Everything was so perfect, the way that it worked. Detroit and Capetown couldn’t have been two more different places. In the movie, we show Detroit during the winter when it’s cold and snowing and then we have Capetown, where it’s summer and sunny… the exact opposite. SPAZ: At what point during the pre and/or post-production did you realize that you had one hell of a film on your hands? SPAZ: A film about a virtually unknown artist is a hard sell. Was it difficult to find people to help back the film? MALIK: Yes, it was hard thing to convince people. He was absolutely unknown in America. Only the die hard music fans knew about him. SPAZ: Rodriguez, “Sugar Man” is your most well-known song and it inspired the title of the film. Can you tell us a little about the song’s origins? RODRIGUEZ: “Sugar Man” is almost like a prayer, you know? That’s all that that is. It’s a tune with words. I describe ‘Sugar Man” as a descriptive song, not a prescriptive song. SPAZ: Malik, maybe even more so than Light In The Attic’s great reissues of his albums, you’ve brought Rodriguez the attention and acclaim he’s always deserved. Was that part of your intention in making the film? MALIK: I only wanted to tell a good story, but I’m honored to be a part of this thing. The film, you’ll see once or twice, but the music, if you like it, it stays with you. You’ll listen to those songs for the rest of your life if you really fall in love with them. It’s going to stay with people much longer than the film does. In some ways, I think this would have happened anyway because the music is that good. SPAZ: Rodriguez, since the resurgence in your music and this film, has your life changed much? And does it feel good to finally be acknowledged for the music you created? RODRIGUEZ: We do music for the girls. We do music for the money. We do music for the recognition. We do it for Rock ‘n’ Roll history. But we do music because it’s fun, because it’s a pleasure. It’s not a spectator sport: you can dance to it; you can sing to it, you can get an instrument and play along with it. That’s the part of it that is appealing to me. SPAZ: Malik, was music a big part of your upbringing and life? MALIK: Yes, very much so. When you are a teenager, it is really the thing that gives you your life, your identity to a large degree. SPAZ: Were you drawn to Rodriguez’s story because of the music? Or do you think that you would have made this film if it was the same story but he was an artist or film maker? MALIK: I really think that the story is good enough. The story tells itself. But the music makes it better. There is so much emotional content in the music that you can’t put it into words. Music is magic. No one can explain why you play certain chords in a certain order and it gives you a good feeling, but it does. It’s just magic. Music was so important to tell this story. SPAZ: Rodriguez, there is more of an interest in your music than ever before. Has this inspired you to go back and create something new for your growing audience? RODRIGUEZ: Yes. I plan to be in the studio this year sometime. It’s got to be good. And that is why it takes so long. I’m working the catalog right now. That’s what they hear and unless I go out and play it, they won’t think I’m on the same page.